The following Fact Sheets summarize the latest trends in international inbound travel and spending in the U.S.
Travel and Trade provides an analysis of the incredible—yet not so obvious—impact of international inbound travel on the U.S. trade balance. International Inbound Travel to the U.S. (2017) offers an overview and illustration of the United States' top inbound visitation markets in 2017.
International Arrivals Cartogram (2017) graphically sizes all countries according to the volume of their residents' visitations to the United States. Top 20 Inbound Travel (2017) ranks the United States' top 20 international inbound markets in 2017 as well as in 2012 and 2000 to show how different countries changed their places in the rankings. It also presents the Department of Commerce's forecast for 2022 and shows how the rankings are expected to shift between 2017 and 2022. Top 20 Travel Export Markets (2017) ranks top inbound travel markets to the U.S. by spending. Global Travel Trends (2017) provides and overview of global travel and spending, focusing in particular on long-haul travel. Individual country profiles are available for key inbound markets and can be accessed by clicking on the links below. 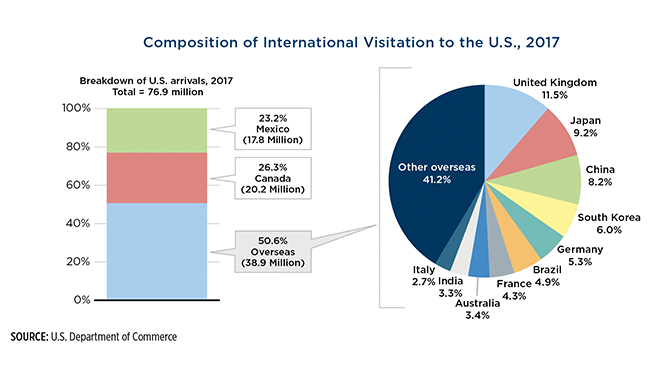 They describe U.S. visitations and overall travel trends for each country, economic impact of U.S. visitations, travel forecasts, and key events that impact travel to the U.S.
As of March 2019, all reports reflect 2017 data. Official 2018 visitation data for overseas countries will be available in June 2019. 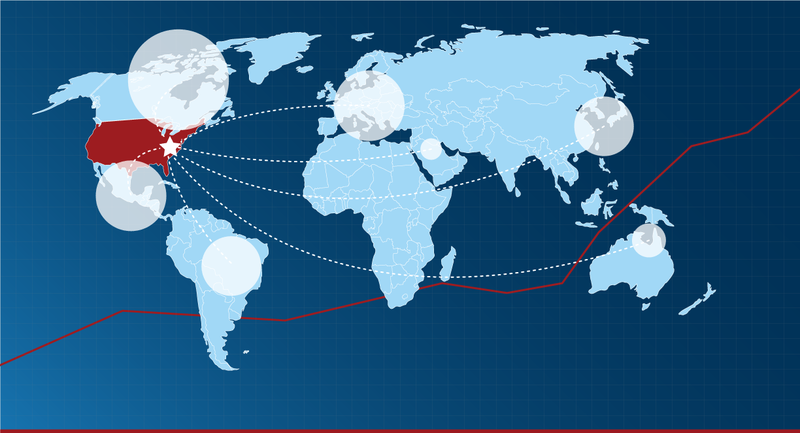 EXPLORE INTERACTIVE TRAVEL DATA FOR INTERNATIONAL VISITORS TO THE U.S.